Property 6: Westport Island Cabin on the river with private dock. Drive, boat or fly in. Property 15: Cozy lakefront cottage w/ dock, mountain views, peaceful location and more! Property 24: Lakefront getaway with panaromic views of Damariscotta Lake inside and out! Beautifully Renovated Ocean Front Cottage With Spectacular Views..
Property 28: Beautifully Renovated Ocean Front Cottage With Spectacular Views.. Cozy House Set On 9 Acres With A Pond. Property 30: Cozy House Set On 9 Acres With A Pond. Property 32: Waterfront home w/ dock access & firepit - close to fishing & hiking - Dogs OK! Property 33: Cozy 3 Bedroom Lakeside Retreat Loaded with Amenities & Nearby Trail Access! Glamping on Mount Desert Island Maine.. An adventure with comfort. 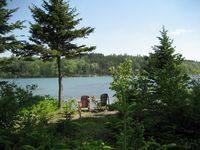 Property 35: Glamping on Mount Desert Island Maine.. An adventure with comfort. Property 38: Lakefront cabin w/ dock, outdoor fire, free WiFi, close to town - Dogs OK! Come, relax, and enjoy true peace and beauty. Property 46: Come, relax, and enjoy true peace and beauty. Property 49: Bayfront cabin w/ incredible views & shared dock - ideal for hunting/fishing! Property 50: Dog-friendly log cabin with gorgeous lake views near beach & snowmobile trails! We plan to come back here each year because of the great stays we've had and this year was no exception. We love snowshoeing behind the house and even though it is a steep start to get up the hill, it is well worth it. We have a new addition to our house- hold this year (a small dog) and took him along on an adventure for the first time. The sideyard was a lot of fun for him as he could run free and play. Since this is close to everything around Bethel we got in some great cross country skiing, snowshoeing and even some downhill at Sunday River. We got a foot of snow during our stay and the plow service made sure we could get out easily. Only some minor shoveling to get the cars out and off we went. Sheryl was responsive to our questions as always and it seems we always have one or two. Check in and Check out are easy and the information provided makes everything clear. 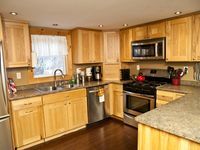 This is one of our favorite places to stay and is actually the only place we have been repeat renters even though we use this service for other places we visit.